Nick Dyck, an immigrant from Russia in the 1920’s, arrived in BC in 1946 and took a job with the Hammond Cedar Division of BC Forest Products. He worked as paymaster and in first aid for the next 24 years. He married Tillie Holman in 1949. His interest in dinosaurs began in 1950 when he developed an enthusiasm for the science of paleontology – the study of fossils. His studies lead to the idea that recreating dinosaurs at something near their original size would be a way to share the information in a way that would enthuse and attract the public. He was right. 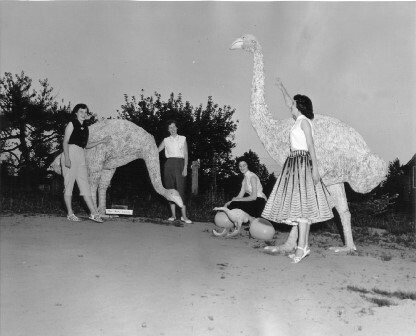 Fall Fair Queen Contestants play in Dyck’s Dinosaur park, 1950’s. Working with pipe, angle iron and cement, he created his first dinosaur – 22′ long and 10’high – a Brontosaurus which was soon joined by a Tyrannosaurus. Both were great favourites with visiting children. By 1958, he had added 8 more dinosaurs plus representations of cave men, a moa, and a Sasquatch. 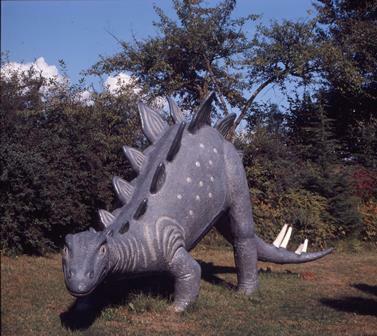 Since the park was attracting a lot of attention, “Dyck’s Dinosaur Park” was officially opened in 1958. 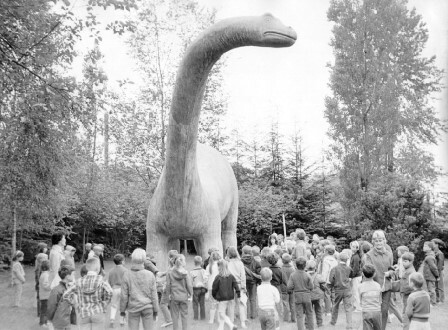 Dinosaur at Dyck’s Park In July of 1969. As Nick didn’t retire until 1970, it fell to his wife Tillie to man the ticket office and oversee the park. They were always adding new features including a fossil house that held items collected on their travels plus other exotica like a dried tarantula and a preserved baby monkey in a jar. After 14 years of amusing and amazing the children of Hammond and a wide range of other visitors, the Dyck’s decided that Nick’s age and health no longer permitted the heavy work needed to maintain and expand the park. The figures were put up for sale in the hope that a local buyer could be found. In the end, the dinosaurs went to the “Flintstones” park on the highway to Hope. The fossil collection was donated to Douglas College in New Westminster. Nick Dyck passed away in 1981, with Tillie following in 1998. 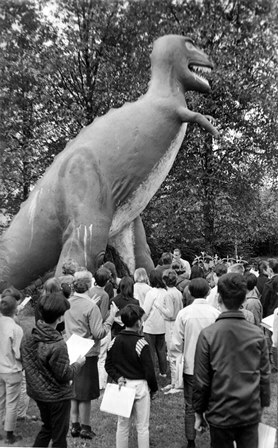 In the late 1950’s, students crowd around the feet of the Tyrannosaurus Rex during a field trip. If you were one of those children who visited the park and have fond memories or a good story or two about Dyck’s Dinosaur Park, please write them down and send them to the Maple Ridge Museum. Dyck’s was a unique element in our history and we know too little about it.